Black with Colour China - 9 items found. A gorgeous soup plate with fabulous floral border surrounding the central scene. Backstamp: Masons's Patent Ironstone China. A little minor wear underneath and to the outer rim otherwise excellent condition. Design printed in black with hand painted colour. Attractive jug with ochre rim and serpent handle. During the Ashworth period this design was named Yin. Mason's Ironstone China at its most ornate. A grand comport with generous splay foot, two bold side handles and a deep bowl for your wonderful display of fruit. The design is black printed with hand painted enamel colours mainly terracotta, with an ochre rim. During the Ashworth period this design was named Yin. The glaze is crazed, but this comport is in excellent condition, still bright and clean after 100 years. Printed backstamp Mason's over a crown, with Patent Ironstone China on drape and England beneath. Pattern number B9441 in script. 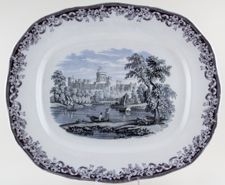 An absolutely wonderful large dish showing Windsor castle with a very pretty floral and entwined ribbon border. No backstamp. Fine all over crazing otherwise excellent condition. Charming view of Windsor Castle with deer park in foreground, printed in black with blue highlighting to sky and river. Excellent condition. No makers backstamp, but view similar to Cauldon's Royal Castle series and also similar to Knight & Elkin's Baronial Halls series.